My main experience of eating sardines has always been from a tin, as fish paste or canned pilchards. I am very fond of them on toast accompanied by beetroot and they are a staple of our food cupboard. I have vague childhood recollections of trying to dissect the fragile bones from a can of pilchards as eating them used to make me shiver, I think in the end we used to give up and mash them all together. It’s always interested me how sardines are positioned in tins as I like the pattern they form. For Top to Tail I wanted to capture how their plump little bodies curved and touched one another. Rather than have them on a plate or rectangular dish I chose to keep them on the paper that the fishmonger wrapped them in. The creases of the paper were delicate and created enough shadow so that the fish weren’t floating. There is also something rather lovely about unwrapping a parcel from the fishmongers. To begin with I had doodled a rough composition and then tried it out using charcoal. The size and shapes are a little incorrect but it gave me a sense of how the painting would work. The sardines were photographed and then baked in the oven with the zest of satsuma - unfortunately I had run out of lemons, luckily it worked and they tasted delicious. Quick charcoal sketch to work out composition of sardines. One of the main challenges of the fish was to try and describe their shimmer. The skin of the sardines has a fragility to the silver areas that contrasts with the smoother deep blues. Initially I had the idea of using more broken marks to describe the skin and then translating these into blotted line for the painting stage. As the drawing progressed I started to see the patterns and lines of the scales. These helped to describe the form of the fish but it was hard to hold onto the contrast between fine areas of light and dark tones. I thought printing black ink on the skin would deaden the shimmer so I tried watering down the ink. It behaved very differently and lacked the sharpness of the black. Once I started to paint it was clear the grey ink and watercolour weren’t working well together and the surface had become too busy. Watercolour painting of Sardines - Failed attempt, the blotted line marks and paint weren’t working together to describe the shimmer of the sardines. After retracing my tonal drawing I decided to go with a less is more approach with selecting my lines to print. Once painted I reassessed certain areas and printed over the paint to add definition. The sardines had many subtle shades of warm and cold blues with touches of green. I limited my palette to Indantherene with dabs of Cerulean and Cobalt. I mixed a few washes in various tones and strengths and mainly used the wet on wet technique as I can quickly add a flash of colour if needed. The fish scales were the hardest part to paint as the direction of their lines gave the form of the sardine’s bodies as well as their shimmer. To block out the highlights on darker areas I used masking fluid, however on the scales, although it took a long time it worked better to paint around the white areas. Sometimes I find masking fluid doesn’t give me the shape or edge that I need. Once the paler tones of the fish had been applied I added the darker blues. The video shows how I paint an area with clean water then drop in watercolour. The final painting evolved completely differently from my initial plans. 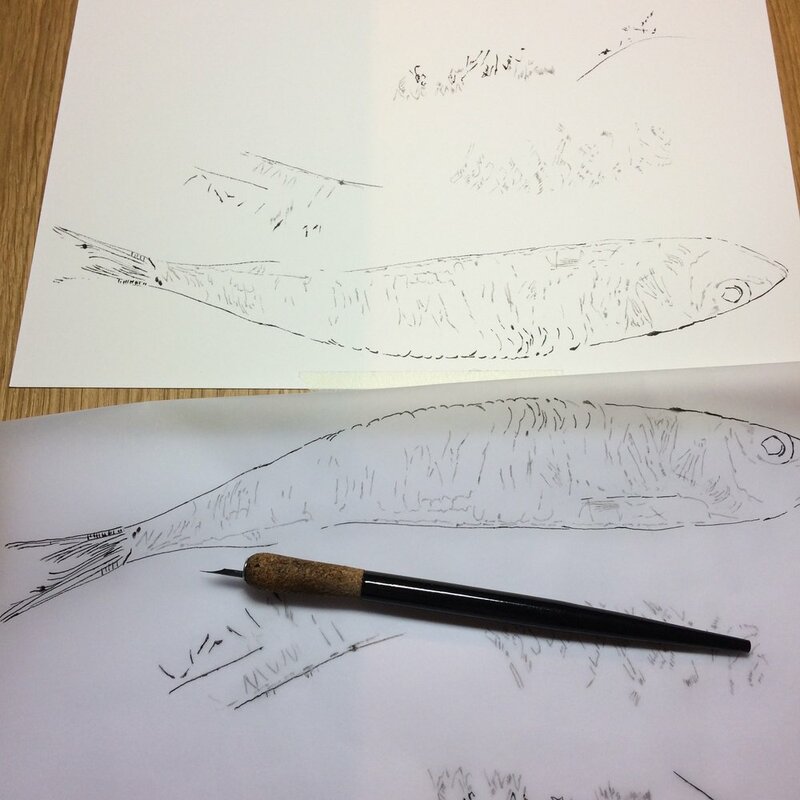 I wanted to use more of the blotted line technique to describe my drawing marks but it didn’t suit the sardines as they needed a softer and looser approach. 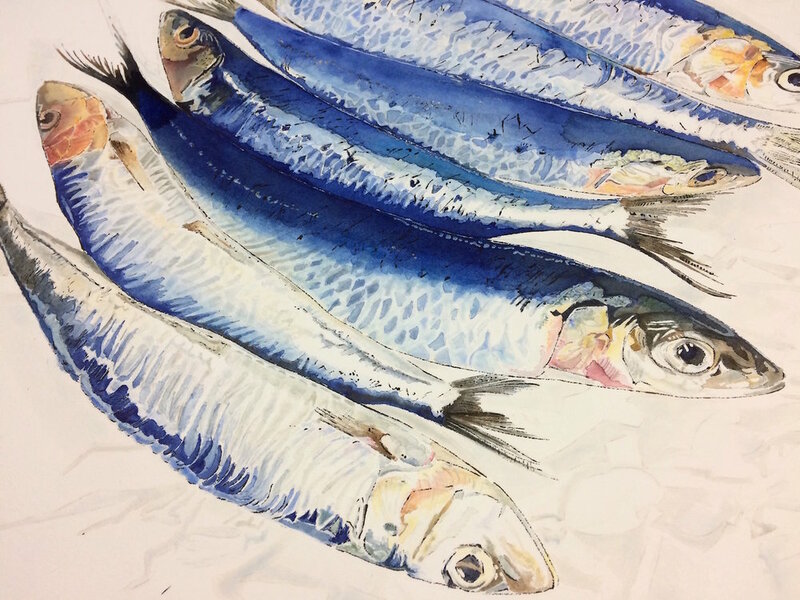 The sardines have been a frustrating but fascinating subject to paint, I think my natural inclination to pattern shows in this piece and it has definitely stretched my watercolour skills.